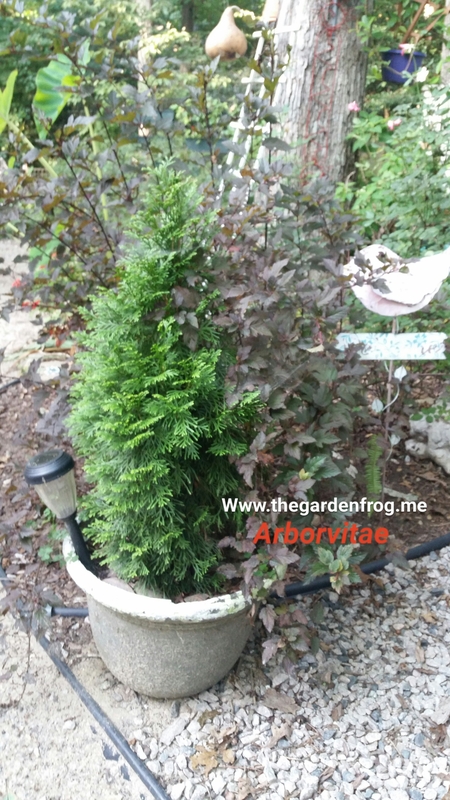 Arborvitaes have been my favorite evergreen shrub for years. I love the rich green fan like ‘leaves’ and the pyramidal shape of the Emerald Green Arborvitae. I love the fact you do not have to prune, shape, or otherwise do any trimming. I love other shapes too– such as Woodward Globe and Hetz Midget which are round. There are other Arborvitaes that are yellow/green and blue/green and some that even turn golden in the winter. There are so many varieties in sizes, shapes, and colors! Shoot, I love them all but the one I usually use is Emerald Green because of its predicted height and width of 8′ tall and 2′ wide. The Green Giant is not a first choice for containers because it will easily grow over 20′ tall here in zone 7 and spread about 5 1/2′. However, when it is on the markdown rack for $3 I cannot resist! 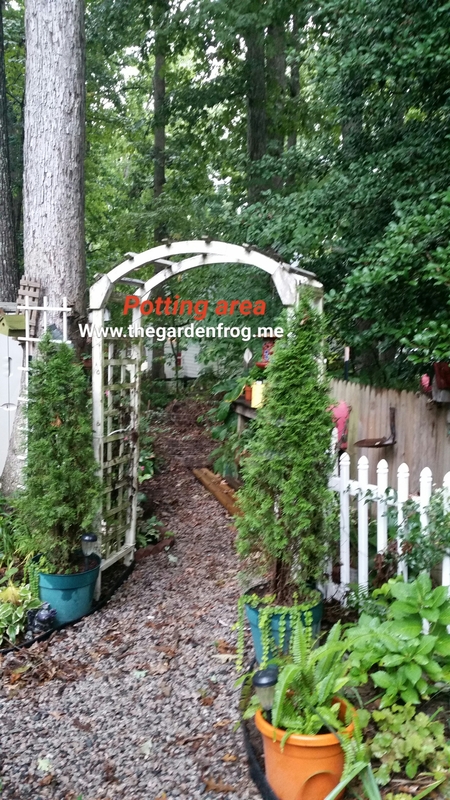 For example: in zone 7, I leave most of my Arborvitae in the pots for at least 4 if not 5 years and in zones 5 and under you could probably get about 8 or more. 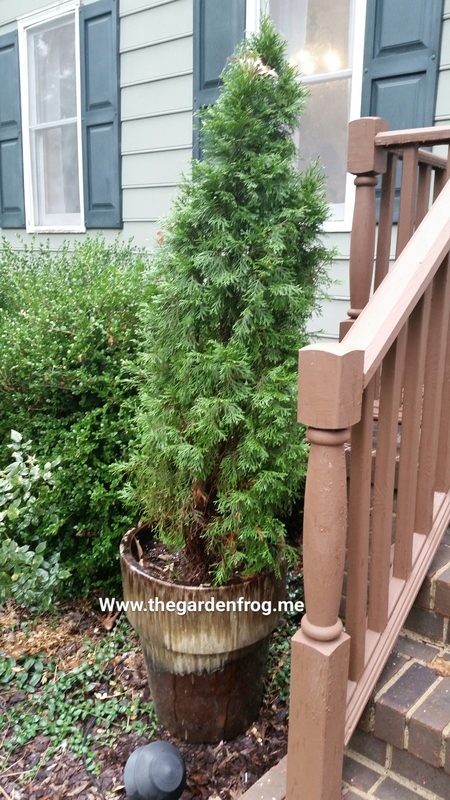 I had Globe Arborvitaes in 2 -5 gallon pots for about 5 years then I had a ‘landscaping’ job where I needed them so I sold them to the client. These happened to be on the markdown rack because they are not perfect shaped. For $3 I do not care! 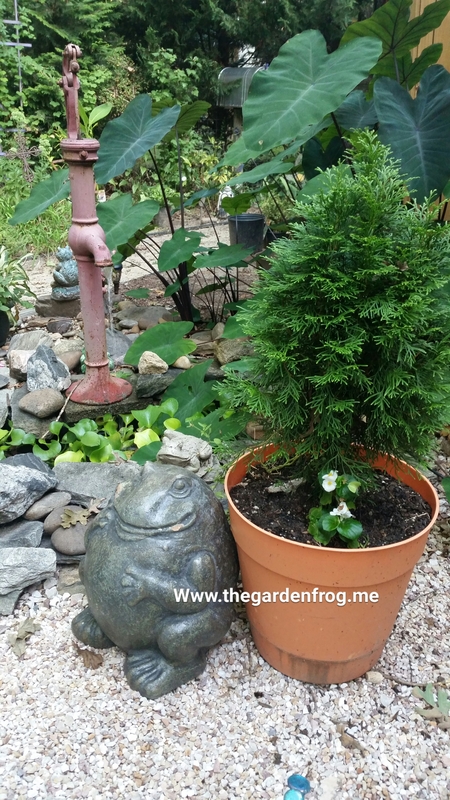 I have many Arborvitaes in pots now, maybe 9 plus 2 more that need to be potted up. I am addicted to using them in pots because they require little care. The roots of the Arborviate are not deep at all and so that makes them excellent candidates for pots. The pictures below are the Emerald Greens I had to dig up in May and place in pots because they were on the neighbor’s property line. They were not flourishing where I had them and since I had no where else to plant them, I decided to put them in pots. Here in zone 7 I can grow Arborvitae in dappled sun and part shade. It will flourish in full sun with adequate watering in containers; and in the ground the Arborvitae will need watering in times of severe drought. I suppose you can prune them for shaping but I never have and never will. To me they are beautiful without the fuss. There are some insect problems that could wreak havoc on your Arborvitaes such as bagworms and aphids but if you catch them in time you can easily save the plant. Aphids can be sprayed with a pesticide or simply give the plant a shower with Dawn dishwashing liquid. As for bagworms, you will need to handpick each one of the brown bags/sacks off the bush and throw them away (I like to burn them to make sure those suckers are dead). 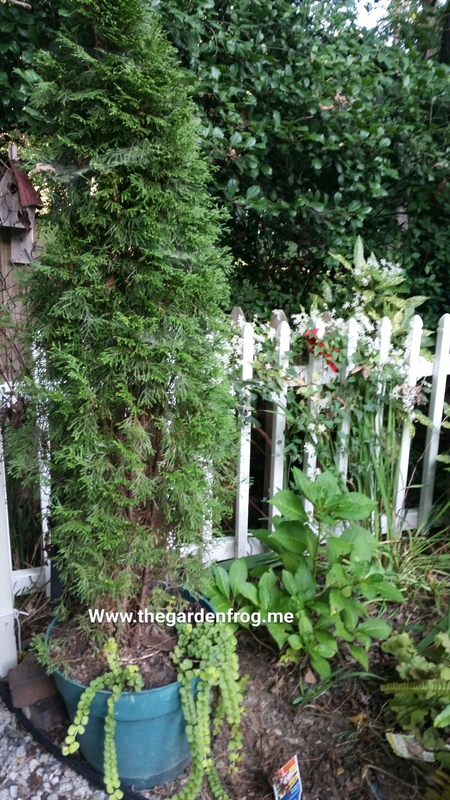 Arborvitaes can develop other diseases but in my many years of growing them I have never had a problem. I would like to give advice for container gardening in zones lower than 7 and especially the zones where winter temps dip in the negative numbers: place all pots together around the base of a tree or the southside of your house or garage and protect the pots with lots of leaves, straw, or even old blankets to protect the roots in the pots. If you can, I would even place them in an unheated garage or shed with a window over the winter and keep them watered about once a week. They need to be protected from heavy snows and ice so when placing them next to a building make sure they are not in the line of falling snow or ice. This year (2015) I did not plant any annuals around the Arborvitae in the pots. In past years I usually put impatiens, vinca, or even petunias around the base of the shrub but this year I had too many things going on to have the extra fuss. In large pots, buying small plants such as the Arborvitae, gives you the center (or thriller) and leaves room for planting other smaller annuals that trail out of the pot. 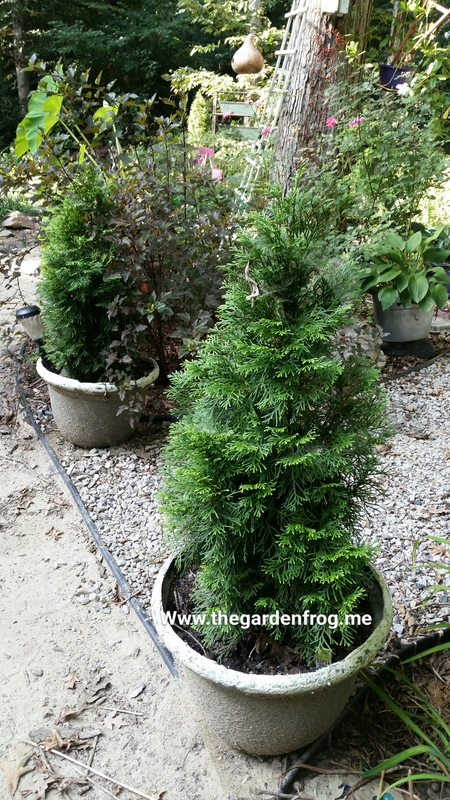 As fall quickly approaches and winter follows, I do not have to worry about empty pots sitting around because many of them are filled with Arborvitaes. You can use any shrub you love and using evergreens, conifers, or even semi evergreen plants will give your pots garden interest through every season. I hope I have inspired you to think outside the box when it comes to container gardening. Another word of advice when buying from the markdown rack: do not buy it if it has turned brown and drying up (over 25% of the leaves). I also do not ever buy plants that are wilting and the pots are soaking wet. Always lift the plant out of the pot and check the roots to see if they break off easily. 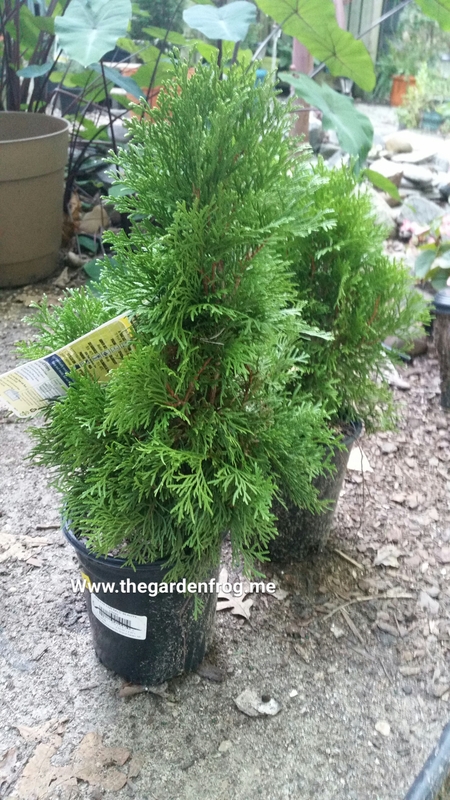 Many times Arborvitaes (at least at my Lowe’s) end up on the markdown rack because it is not perfectly pyramidal or a branch broke off. The branch grows back and the I am a messy sort of gardener so imperfection is my perfection!